One of the most fascinating things about the huge Australasian strewn field is the absence of a source crater. The low angle impact, as evidenced by the extremely asymmetrical distribution of tektites (see map below), may not have left a typical rounded crater. Indeed, the elongate shallow lake in Cambodia called ‘Tonle Sap’ has been suggested as a possible crater. The tektite distribution, however, might be better explained by an impact in the Gulf of Tonkin area; this is the authors favoured option. Clearly in that region a depression could very quickly be buried and disguised by deltaic sediments. This website will guide you through the different tektite morphologies and sculpture. It is these data that offer the field geologist irrefutable evidence that the crater is in the Indochinese region. 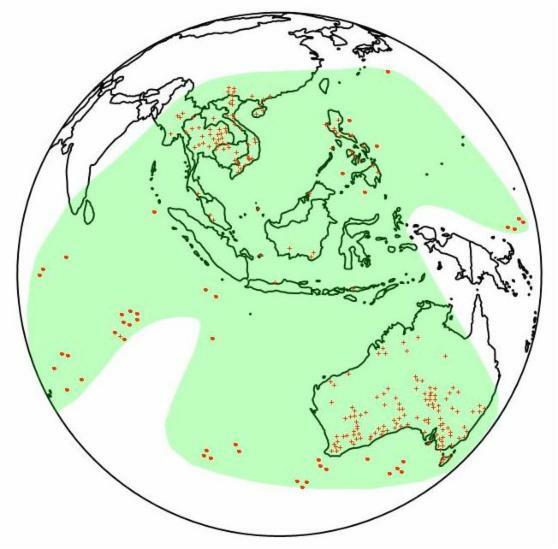 ABOVE: Distribution of tektites (+) and microtektites (●) from the Australasian strewn field. In strewn fields where the source crater is known, the area immediately surrounding the source crater does not yield tektites, although this may not apply to a low angle impact. Closest one expects Splatform and Moung Nong-type (effectively very large splatform) tektites. Splatform tektites landed whilst still semi-molten, only having a very thin solidified outer crust. They show secondary surface sculpture and modifications caused when impacting the ground. As one moves further away, splashforms are developed. Splashforms did not deform when they landed, indicating they had a thicker cooled outer crust and were more solidified. 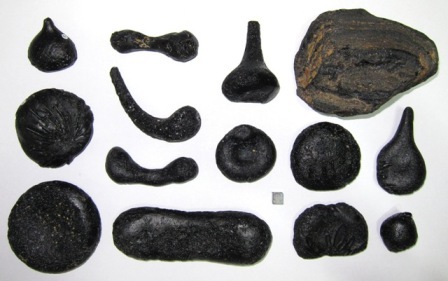 Splashforms show the originally formed tektite shapes, although they do show secondary surface sculpture. Then come the Philippinites, which are intermediate, having cooled sufficiently to become brittle. These forms develop thermal cracks during re-entry. With further distance from the impact, Australites have formed, which exhibit extreme ‘end members’ showing highly ablated and spalled morphologies. I have termed Australites ‘solid ablated splashforms’ as I believe the re-entry modifications occurred on a solid body. 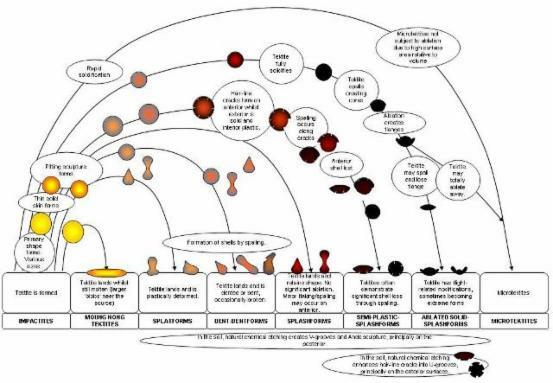 It is important to study the tektites with distance from source to understand their relationship and the overlap of the different morphologies. This effectively gives a sequence of events. My collection of tektites is growing and with expansion my database increases. In this website I have studied the surface sculpture. If something cuts something else then it is younger, thus demonstrating an order of events. We know when some events happened (e.g flange formation on Australites. If something cuts these features it occurred after the flange formation ablative stage, if it is cut/covered by these features it occurred before landing, and so on). ABOVE: Proximal Indochinite tektites. These have been plastically deformed. 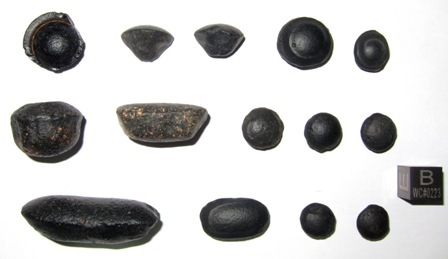 ABOVE: Medial tektites from the Philippines. These re-entered as solid bodies and spalled. ABOVE: Distal tektites from Australia. These re-entered as solid bodies, ablated and then spalled. 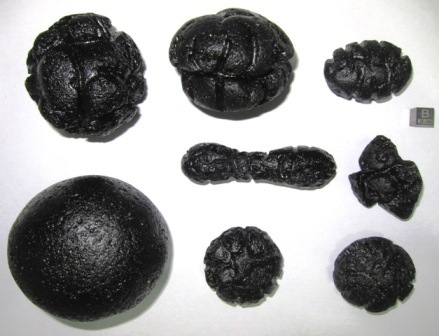 I believe that surface sculpture and morphology of tektites clearly reflects the history of the tektite. It tells us what happened to the tektite during flight and at the point of impact with the ground. Certainly some of the sculpture is considerably enhanced by chemical etching, but the etching is not random: it follows pre-defined lines of weaknesses. 1) The original shape was determined primarily by the speed of rotation (if any) and the axes of rotation when the tektite was flung out by the impact. This created spheres to ovals to dumbbells to tear drops. 2) The tektite was ejected at a specific velocity, determining whether it would be shot a long distance or a short distance. 3) The tektite was ejected at a specific angle determining, in conjunction with velocity, whether it would be shot into space, travel a long distance or travel only a short distance. Additionally this would also determine the angle of re-entry, which would have a big impact in defining the secondary modification. This angle is also important in that the higher a specimen goes the less the atmospheric drag and also the slower the cooling rate would be (as vacuums are insulators). 4) The original size (and original temperature) of the body ejected. Larger bodies retain heat longer (but may also not have been melted to the same degree). The solidified outer glass shell is a poor conductor of heat and would insulate the tektite. 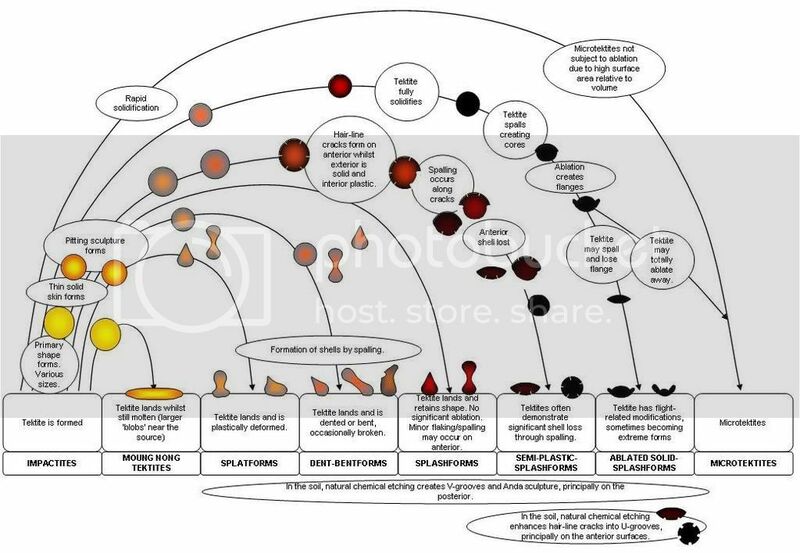 Whether something is molten/plastic/semi-plastic/solid when it re-enters the atmosphere or hits the ground has a big impact on final morphology. With distance from the source, tektites become more solid (less plastic and more brittle), but larger and more spherical tektites would retain their heat longer due to a lower surface area to volume ratio. Larger specimens are therefore less solid than small specimens at distance from the source crater. 5) Once on the ground, over many thousands of years the unstable tektite glass is etched along lines of weakness. These create V-grooves on primary surfaces, attacking residual stresses and strains in the tektite. On anterior surfaces, which suffered temperature extremes during re-entry, the surfaces are covered in U-grooves following complex thermal cracks or are pock-marked. 6) Finally, terrestrial weathering and transportation may modify the shape to a greater or lesser degree. Water transportation and wear (which is easily distinguished) is common. Biological transportation may also take place, by man (using tektites as tools or prized objects) or birds (using tektites as gizzard stones). ABOVE: Suggestion of formation and subdivision of Australasian tektites. Note that different forms overlap geographically, but the diagram presents a very generalised distribution pattern with distance from the source crater. Please click on image to see larger version (opens new window).